Recipe and photo from the Vegan Culinary Experience. The best way to do this is keep your garlic in the paper, and heat a cast iron skillet over medium heat. Place your garlic inside and allow this to sit for about 10 minutes on each side, until the garlic paper is slightly blackened and you can smell the aroma. Then turn to a new side until all the sides are done. Allow the garlic to cool. Remove the garlic cloves from their paper skins and mince. Place the yeast, water, and sugar in a glass bowl. Lightly mix with your fingers and allow to rest about 5‐10 minutes. The yeast mixture should start to bubble. If it doesn’t, you might have old yeast, so you might want to try again. In a large bowl, combine the flour, salt, chili flakes, and salt. Add the roasted garlic and the olive oil, and slowly add the yeast water, mixing as you go. If you have a large stand mixer with a dough paddle, this is the time to use it. If not, you are going to get a work out. You want the dough to stick to itself and not you. Add a few drops more of water, or a little bit more flour until you have this consistency. Once you have it, knead the dough for at least ten minutes. Cover and allow the dough to rest in a warm place for about 1 hour. It will get big. Very big. Punch the dough down after the hour and knead again for another 5 to 10 minutes. Then, the magic happens. Roll the dough out into your desired shape. For bread sticks, I like an oblong shape that you can cut into bread stick shapes. 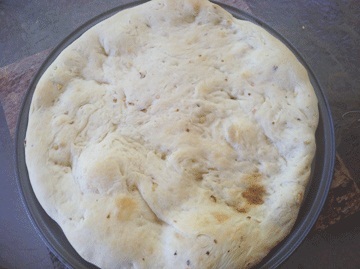 For the pizza crust, roll out into one or two circles (for two thin crust pizzas), place on your pizza stone or baking sheet, and trim or stretch to match the pan. Cover the dough and let rise for another 1 hour. Preheat your oven to 450ºF. Remove your cover from your crust, and bake it for about 5 minutes. Cover the crust with your topping and bake about 10 more minutes.